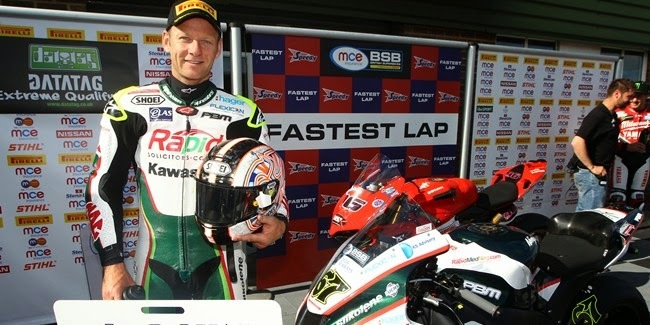 Shakey Byrne continues to take the British Superbike Championship by storm at Snetterton, after a six week break, by putting his Kawasaki on pole position for race one. In Q3 the Rapid Solicitors Kawasaki rider blitzed the lap record by chipping away at his lap times and eliminated allcompetition from the likes of Josh Brookes and Jakub Smrz. After returning from a bout of road racing, it was Brookes who set the early pace in qualifying when he finished Q1 at the top of the time sheets. However, the Milwaukee Yamaha rider was edged out in the remaining qualifying sessions by Byrne and forced to settle for second place, 0.486s off the pole-winning time of 1m47.488s. In the closing minutes of Q3, both Smrz and Julien Da Costa squeezed Tommy Bridewell off the third place position forcing the Milwaukee Yamaha rider onto the second row of the grid in fifth. This has marked a strong return to BSB for Da Costa, who will ride four rounds as a wildcard for Honda Racing, he heads up row two for race one. Race one will get underway tomorrow at 1.30pm.